MIKEL: Is he what Chelsea are missing away from home? When Chelsea play at home we expect teams to sit back and defend. 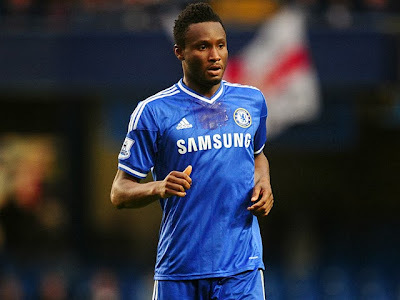 Away from home teams will look to attack us and is Mikel what Chelsea have been missing away from Stamford Bridge? John Obi Mikel has been overlooked so far this season by Jose Mourinho as he has for the most part favoured a combination of Frank Lampard and Ramires. Against Arsenal, Mikel was outstanding so should Mikel now start instead? Let's be honest here, Mikel is the best defensive midfielder we have and has natural defensive instincts to somehow, find himself in the right place at the right time more than people realise. How many times have you seen him win the ball or nip in with an important tackle!? At St James Park on Saturday against Newcastle, I expected Mikel to be named as a starter in place of Frank Lampard just to give us that extra insurance in front of the back four. I expected Lampard to be rested and play this week against Schalke instead. The problem Chelsea had on Saturday was giving possession away with either a stray pass or a ridiculous flick that never came off and allowed Newcastle possession of the ball. As we all saw, the second half Newcastle were more or less playing us on the counter attack and for me Mikel being there would have provided us with better options to protect the back four. Apart from Everton away, in the games we have failed to win, Mikel hasn't started any of them and has been left on the bench. He was a late substitute against United at Old Trafford, again against Bayern Munich and the defeat at home to Basel he was left on the bench. Our problem at the moment appears to be away from home and for me, Mikel should be a nailed on starter. It's all well and good having all the flair players we have but at the same time you need that insurance at the back that Mikel provides you better than Ramires and Frank Lampard. Jose Mourinho spoke of making 11 mistakes with his team selection on Saturday, for me the main one was Mikel for Lampard!